What is amaranth? Also known as Chinese spinach, amaranth is a plant with leaves that resemble and taste like spinach. Some types of amaranth plants produce seeds that are considered a kind of grain. With over 50 amaranth species known and growing all over the world, amaranth is a versatile and highly beneficial plant which can be cultivated for either the leaves or seeds, or even for decorative purposes. This plant flourishes in warm climates and can grow up to four feet in height, with some giant varieties topping out at over six feet tall. It is a rapidly growing plant and can be harvested around six weeks after planting. Amaranth has been called the "crop of the future" because it is cheaply and easily grown, resists plant diseases, can survive in dry climates, and needs less fuel to cook. Because it has a "weedy" ancestry, amaranth grows quickly in just about every environmental niche, with some of its seed heads producing over a half million seeds over the course of its life. Fiber amounts in amaranth seeds are three times higher than that of wheat. In addition, they contain twice as much calcium as milk. When mixing amaranth with brown rice or corn, you will receive a protein value equivalent to chicken, red meat and fish. Discovering what is amaranth means finding out about the many uses for its seeds, which can be purchased in holistic food shops. When cooking with amaranth seeds, you can first either ground them into gluten-free flour, toast them or cook them with other whole grains. Amaranth seeds are also added to soups and stews in order to create a thicker density. In addition, these seeds contain protein and certain essential amino acids which other grains such as wheat or bulgar do not have. Cooking with grains involves similar techniques as cooking with amaranth. 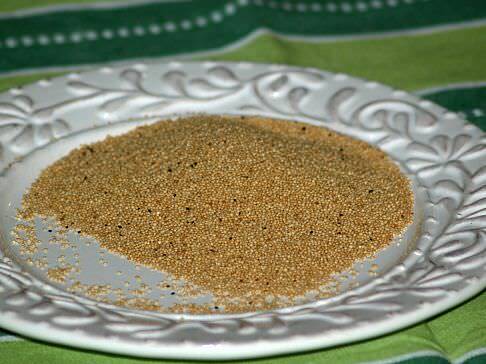 You can grind amaranth seeds into a coarse flour, toast the seeds or even pop them like popcorn. Leaves are cooked much like spinach leaves or eaten in salads. When using amaranth flour to bake breads or noodles, you must mix flour with it that is also used in yeasty breads so that it will rise. As a rule, most recipes for amaranth bread calls for three to four parts of grain flour to one part of amaranth flour. If you want to make flatbreads or pancakes, you can use nothing but amaranth flour and forgo the grain flour. Amaranth seeds may seem stickier than other grains after being cooked. Make sure you do not mistake this texture for not being fully cooked yet, as overcooking these seeds will cause them to be chewy and even more sticker. Store unused amaranth seeds in a sealed glass jar in a refrigerator. You can then use these seeds for up to six months before they lose their taste and nutrients. No book of what is amaranth recipes would be complete without including a recipe on how to make this delicious Amaranth Applesauce Bread. What is amaranth in this great salad recipe? NOTE: I place a cheesecloth in a strainer and then place strainer over a bowl. Put yogurt on top of the cheesecloth and let it drain overnight. If I am in a hurry, I wrap the cheesecloth around the yogurt and lightly squeeze out excess liquid. NOTE: To cut down on some of the preparation you can use sliced almonds and use pears out of the can or without broiling. It is just as good and saves a lot of time. TRANSFER YOGURT to a bowl; season with salt and pepper and set aside. TO TOAST HAZELNUTS bake on tray about 8 minutes until golden. Remove from oven; turn oven OFF and HEAT BROILER. Transfer nuts to a kitchen towel rubbing together to remove skins; chop coarsely. TO PREPARE AMARANTH bring water to a boil in saucepan. Add a pinch of salt and the amaranth stirring to cover amaranth. Simmer amaranth over low heat stirring occasionally until amaranth is tender. NOTE: The water will evaporate taking about 15 minutes. Season with salt and pepper and cool stirring once or twice; set aside. TO PREPARE PEARS brush quarters with 2 teaspoons of oil; season with salt and pepper. Place under hot broiler until lightly charred about 3 minutes on each side. TO MAKE SALAD combine the lemon juice and chives in large mixing bowl. Add the remaining 1 tablespoon PLUS 1 teaspoon olive oil, endive and pears. Add ¼ cup of the toasted hazelnuts; toss well and season with salt and pepper. TO ARRANGE SALAD PLATE line 4 plates with salad mix making bottom layer. Over each salad mix spread the yogurt mixture. Top each with a heaping tablespoon of the pickled beets. Next top each with 1/3 cup of the amaranth. Cover and refrigerate 30 minutes until cold. 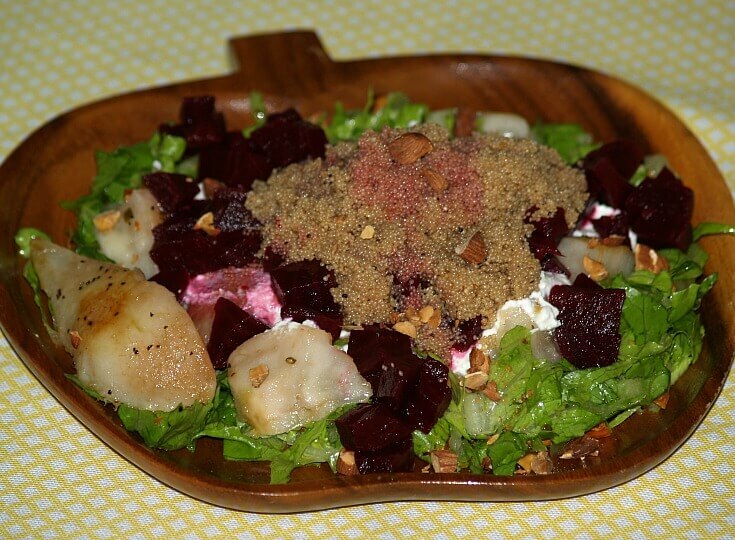 GARNISH salad with a little of the remaining beets. Sprinkle with remaining toasted nuts. Drizzle with a little of the reserved beet juice and sesame oil. WHAT IS AMARANTH? Find out by trying this salad. After blending all ingredients together (except for brown sugar and cinnamon), pour mixture into a greased bread pan and sprinkle the sugar and cinnamon on top. Bake for one hour at 350 f degrees. Let cool for ten minutes before serving with coffee or tea. What is amaranth juice treatment? Well, besides all the health benefits amaranth has to offer, it is also an effective facial treatment which can eliminate a bad complexion and reduce lines that come from sun and aging. Simply add crushed amaranth leaves to even parts of milk and lime juice and gently massage this ointment onto your face before bedtime. Leave it on for 30 minutes before washing it off with warm water and patting dry. Mix amaranth with water yogurt mixture; let set for at least 7 hours. Bring the 1 cup of water and salt to a boil; add the soaked amaranth. Reduce the temperature, cover and simmer amaranth for a few minutes. Remove from heat and stir in flax seed; serve with butter, honey, cream and fresh fruit.